Today, on World AIDS Day, we support everyone affected by HIV. We applaud prevention and treatment efforts, and we honor those who died of AIDS -- more than 25 million people worldwide. 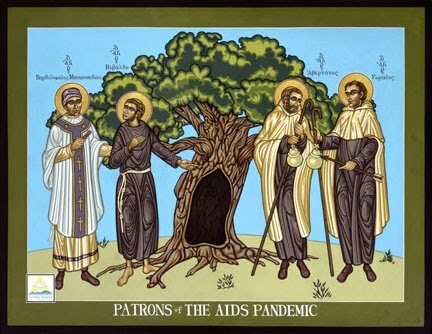 “Patrons of the AIDS Pandemic” by Lewis Williams shows two pairs of medieval male saints who faced disease epidemics together with friendship and faith. Their man-to-man bond speaks to the gay community, where AIDS has a disproportionately large impact. The couples stand on each side of a chestnut tree, a symbol of life after death. On the left are 13th-century Franciscans who ministered in an Italian leper colony: Blessed Bartolo Buonpedoni and Blessed Vivaldo. Bartolo got leprosy while caring for the sick, so he had to live in segregated housing. 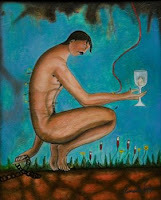 His loyal friend Vivaldo moved into the leper house with him, even though he himself did not contract the ailment. They lived together for 20 years until Bartolo’s death. Today there are effective treatments for leprosy, now known as Hansen’s disease. AIDS has taken its place as a dreaded and stigmatized disease. World AIDS Day holds great personal meaning for me. 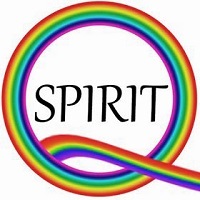 I ministered in the LGBT community of San Francisco in the late 1980s, back when there were no effective treatments and AIDS deaths were common . I wrote about the experience for Christian Century magazine in an article titled “We Are the Church Alive, the Church with AIDS.” The article is reprinted in the book The Church with AIDS: Renewal in the Midst of Crisis , edited by Letty Russell. I lost many friends to AIDS. In their memory, I am pleased to add this post to the LGBTQ Saints series here at the Jesus in Love Blog. If you want to add more names, leave them as a comment and I will insert them with the candles later. More spiritual resources for World AIDS Day are available at mccchurch.org. Thank you for this lovely post. Please add our friend Charles Hosley to the memorial candles. And also another friend that I saw on somebody else's list. I'd lost track of Randy and didn't know that he had passed on. ...May they rest in peace. Welcome, Hence72, and thanks for leaving your first comment here.